It is a grey and rainy morning here today. So often we wake up and look out the window and say “what a miserable day” or “what an ugly morning” or similar. How sad that we just dismiss that gift? No matter how terrible our circumstances are, we can still witness the beauty of life in all it’s forms, if we choose to. We have a choice. And we can choose thoughts of a positive or negative nature. You control your thoughts, don’t let your thoughts control you (sometimes easier said than done). My son asked us to drop him at school instead of taking the bus. 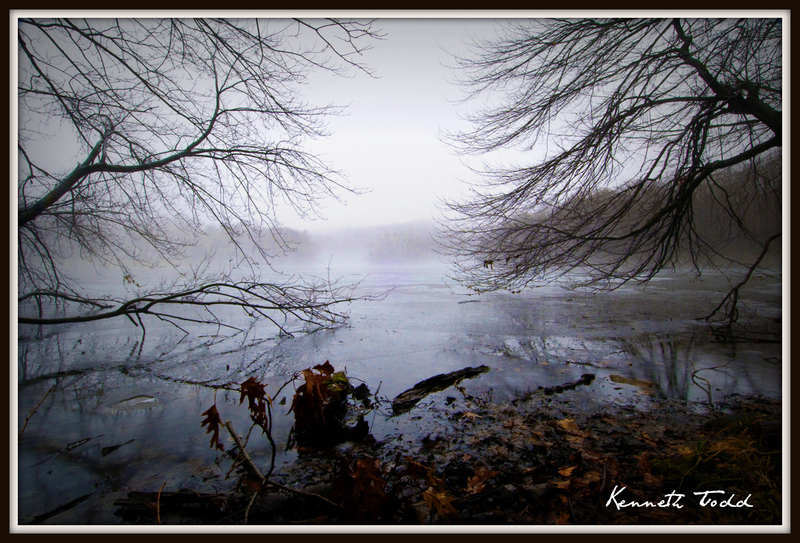 I grabbed my camera and tripod as I just knew I would see something through this grey, rainy mist. Right by the school is this lake, partly frozen and covered in fog. I walked down a path to this spot. The trees instantly grabbed my attention. The dried out leaves and broken branches at the lake shore were not the most attractive for the “perfect” photo. But I didn’t want to move them. Everything just blended together and that was life in front of me, doing IT’s thing. No need for a wise guy human to try control the scene. I only took 5 shots as rain was starting to hit my lens and I was drenched. I love the mysterious nature of the scene, the fog, the distant island barely visible and the branches of the trees providing the frame and forcing the eyes down this channel to view the abyss. The branches also look like they are reaching out to the partly frozen lake and saying “Hold on to me, I can pull you out of the harshness”. It’s a beautiful day, even when grey. Just witness it – no judgements. Your images and your attitude about life is are inspirational. I look forward to your posts every day. Thanks! How easy it is to focus on the negative – people seem to be addicted to it. When we stop, and look, really look, we see, and become immersed in the profound beauty and absolute perfection of All That Is…. And it’s always there! In every moment, in every scene, in every challenge, in every thing. Acceptance opens ones eyes…. Beautiful post, Ken, well done and thank you. I love your attitude toward life and beauty. This photo and this day are both perfect. A lovely post and a spectacular image. Simply gorgeous. Thanks for the reminder! That looks great! I’ve always loved foggy, misty scenes. This is as gorgeous as the sunshine! Wonderful photo! almost as if the tree branches are holding the water in a soft embrace … what a fabulous shot … the mist and fog, and the framing … great stuff. This is such a moody photograph. It is very emotional, with the mist clearing away to give clarity. The long branches laying over the water suggest that they are reaching out into the mist, trying to find the mystery being slowly revealed as the mist rises. I love this. I love the picture. Your thoughts here remind me of what I often try to tell myself on days like the one you’ve written about: Begin each day as if it were on purpose. every so often a photo makes me gasp. this one did. thank you! Thank you appreciate your comments.